Here's our cake. Don't you love my sister's new cake plate(from Williams-Sonoma, http://www.williams-sonoma.com)? Yesterday was National Pineapple Upside-Down Cake Day. Nevertheless, pineapple upside-down cake has long been a favorite of mine. It’s a dessert with many associations. 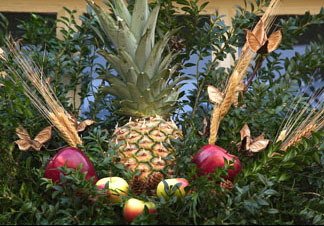 The pineapple itself has long symbolized hospitality and elegance. To me fresh pineapple is a magical fruit—a perfect blend of sweetness and acidity. I know the pineapple we get in the northeast can’t compare with its cousins in their native climes. Nevertheless, if left to ripen for a few days a fresh pineapple can give us Yankees the illusion of living in a tropical paradise. I generally eat the fruit plain—but I’ve been known to put it in fruit salad or salsa. Pineapple upside-down cake is a simple comfort food I remember with joy from my childhood. Even made with canned pineapple it delights eaters. When I worked as a demo cook at Bloomingdale’s I kept canned pineapple on hand for days on which I was uninspired. A quick batch of upside-down cake made even the most fussy of customers happy. The cake is even better when made with fresh pineapple. To tell you the truth, the flavor isn’t terribly different. By the time you bake fresh pineapple pieces they taste a lot like canned ones. Nevertheless, I love having more substantial chunks in the cake than one can achieve with canned pineapple. I think it would taste even better with a little rum added along with the vanilla, but I couldn’t find rum in the house so I don’t know for sure. If you’re interested in the history of pineapple upside-down cake, take a look at the Food Timeline’s copious notes on this item, which include vintage recipes. If you’re interested in making your family happy, bake this cake! If you’re using the cast-iron skillet you may continue with the recipe at this stage and cook the cake in the skillet. If not, transfer the brown-sugar mixture into a 9-inch round cake pan. Spread it through the bottom of the pan. Arrange the pineapple pieces on top as artistically as you can. 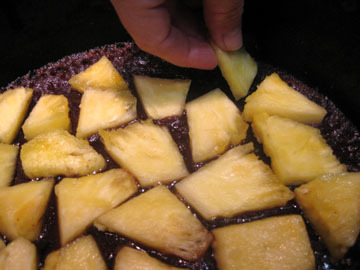 Spoon the batter over the pineapple in the cake pan or skillet, and place the pan in the oven. Bake until the cake tests done (in about 40 minutes). This entry was posted on Wednesday, April 21st, 2010 at 11:27 am	and is filed under Cakes, Pies, and Pastry. You can follow any responses to this entry through the RSS 2.0 feed. You can leave a response, or trackback from your own site. Now, have you got a good recipe for a Boston Cream Pie? That was my absolute favorite dessert as a kid. It fostered my love for anything with custard to this day. Eclairs, creme brulee, a custard doughnut, the list goes on. I need your help as I want to make and conquer the art of making pastry cream, it will be the death of me, I am certain. That and sausage and bacon. Here you go, Donna. It was a little flat (maybe I didn’t have the eggs at room temperature?) but very tasty. I hope it isn’t REALLY the death of you! That looks wonderful! I’ve only made pineapple upside down cake once because I never grew up eating it but it was delicious, (I added some extra sharp cheddar cheese to my batter) So thanks for the reminder…I’ll be making this again soon-Thanks! I lived in Hawaii for about 4 years as a young bride, and the pineapples were heaven! Even though most of them come from Hawaii still, they don’t seem to taste the same when eaten in Georgia. Maybe pineapple is a state of mind. But, pineapple upside down cake is one of the cakes I could actually sell to my kids. They used to eat the top (bottom) part and leave the cake part, though. Yours looks super (and so does the cake plate). I think we have these sort of food days/weeks here, but I’ve never heard of pineapple upside down cake day!! A friend gave us a fresh pineapple from his garden last week – wish I’d seen this then! But I’m sure we’ll get more and will look forward to pineapple upside down cake. As a kid my favorite cake was undoubtedly my mother’s chocolate cake. But in retrospect, faulty memory, or an evolving taste, my favorite cake has got to be pineapple upside down cake. I quite agree that the question of fresh versus canned pineapple is rendered moot after the cake is baked, but the virtue of labor-saving canned pineapple are the rings, which when arranged delicately produce a wonderful stained-glass effect (with cherries at the center hole of each pineapple ring). I have a 22″ diameter paella pan (don’t ask why) and I can imagine, given enough colorful fruit and relying on some of the citron used in fruit cakes, creating a huge upside down cake with the luminosity of the rose window at Chartres cathedral. On the other hand there is the technical problem of upside downing a cake that large. Hi Tinky! I love pineapple upside down cake by my favorite cake is tres leches. Thinking about making it for an upcoming Cinco De Mayo party! Yes, a well-loved special cake for company at my mother’s in Michigan in the ’50s and ’60s. I remember canned pineapple rings with half of a maraschino cherry plopped in the center of each ring. 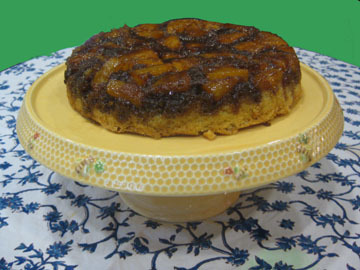 My mother also made rhubarb upside down cake with fresh rhubarb–also yummy. Let me know if you’d like the recipe. At the Trophy Cupcake shop in Seattle I recently saw their “Pineapple Upside Down Cake” cupcake–complete with a cherry on top. Fun! OK… if we’re gonna be friends, I’d better keep my gym membership up-to-date. I gained 5 pounds just reading the recipe — but it was totally worth it. It has been ages since I have had Pineapple Upside Down Cake, The recipe sounds so great. It is now officially on this weekend’s menu.